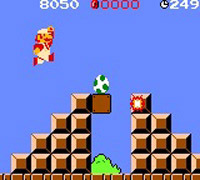 A Game Boy Color remake of Super Mario Bros.
As well as the original game, Super Mario Bros. Deluxe features several new modes, including Challenge Mode where you have to find hidden items and get a high score in each level, and You vs. Boo where you have to race a Boo through some all-new levels. In Japan, Super Mario Bros. Deluxe was exclusively available through the Nintendo Power download system. In the U.S. and Europe it received a standard package release.